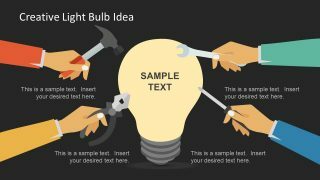 The Creative Light Bulb PowerPoint Shape is a unique design for presenting innovation and creative ideas. The shape is a metaphor for a bright idea which appears like a glowing light bulb. However, this PowerPoint shows the concept of ideal solution for the innovative design. The template is useful in several application presentations. Such as, technology, construction, brainstorming various project processes or mind activities. The light bulb depicts goals and purpose for creating a significant invention project of an organization, leading towards success. 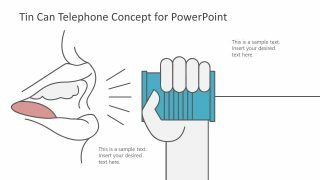 The business professionals, teachers, students and entrepreneurs can make an outstanding proposal or invention presentation. Add the solutions, tools and techniques to rectify complex problems. The Creative Light Bulb PowerPoint Shape highlights the technical aspects and solutions for the innovative goals. The illustration of hand holding construction tool demonstrates constructive gears. Such as, a DIY idea for home improvements, a solution for product or service features or productive brainstorming. 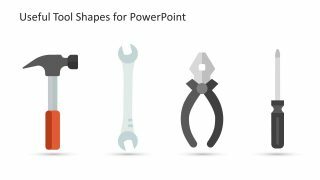 This amazing PowerPoint helps present key elements with toolkit clipart icons providing outstanding solutions. For example, hammer, wrench, plier and screwdriver in man’s hand directing towards the light bulb graphics. 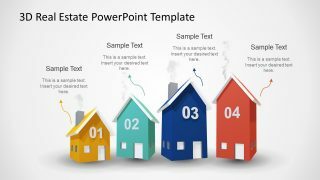 The PowerPoint contain black and white background slides to display editable background color options. The further two slides contain construction tool shapes, instruments in hand and another template of tools only. 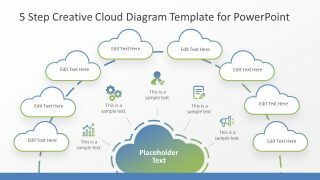 The text placeholders however enable users to add information relevant to the subject. 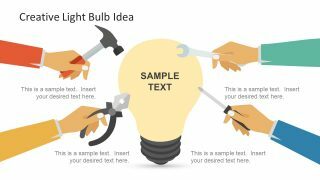 The shapes of PowerPoint creative light bulb enable audience to engage with visually attractive and colorful graphics. 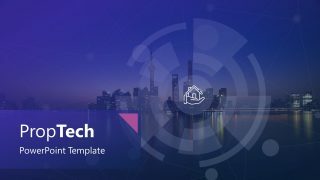 Although all the elements of this template are easily customizable, which lets users modify multiple aspects of presentation. 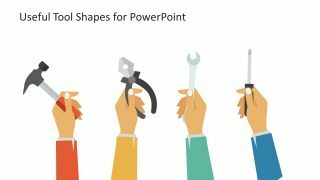 Such as, duplicating objects or slides, use clipart and shapes in another presentation by copying. Moreover, change the colors of tools, hands, sleeves, bulb etc. Similarly, customize shape effects such as transparency, 3D, preset or reflection. Further, implement the design and style changes in minor objects inside the shapes etc.